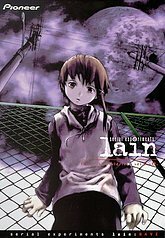 From the main menu select the 'dot' above the 'i' in Lain. It's much like the Easter Egg in the sequel (Knights). There's a white screen with nihongo kana. Then you see Lain in a field in her bear pajamas.